This month, I’ve been speaking to the team over at Revo about car tuning basics, what it involves and why people do it. Personally, I’ve not had a car tuned by these guys, so it was great to get over to their HQ in Northampton and look around their workshops, go out in some of their cars and get all the ins and outs of the tuning world and what Revo are all about. 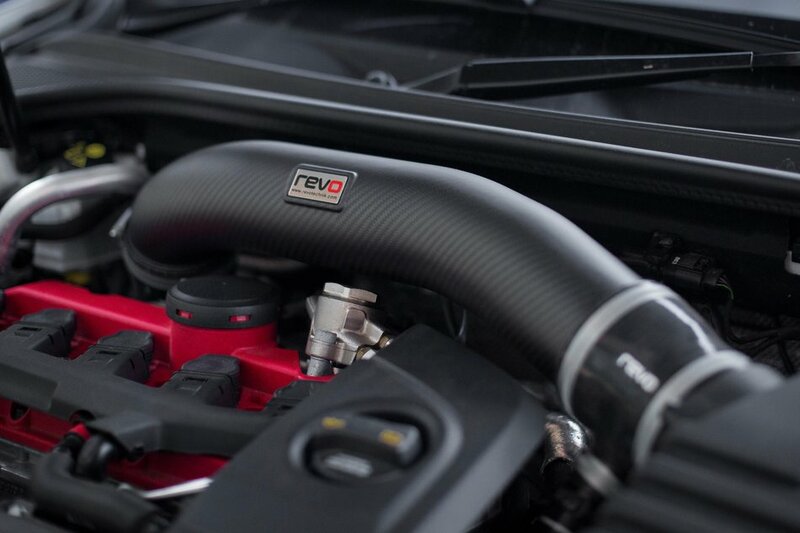 I was lucky enough to be taken out in their 466bhp Stage 2 Audi RS3 and their 433bhp Ford Focus RS – both amazing cars, and the power they produce from their various tunes is truly incredible.I spoke to a Daniel Edwards, Revo’s Marketing Manager, to discover the benefits of getting your car’s engine tuned. Why should you tune a car? We’re maximising the potential of the engine and car to improve drivability and increase the power output while retaining reliability. ECU stands for Engine Control Unit, and that’s exactly what it does: controls the engine. Most manufacturers have a range of models and build vehicles to make them appealing to certain markets. As a result of this, the power output of a standard vehicle is quite often limited; manufacturers can’t have a 1.4-litre vehicle out-performing their 2.0-litre offering. Typically, there’s a lot of headroom to push things further than the manufacturer has, but Revo differ from most other tuners you’ll come across. Not all cars can be tuned the same way, so we extensively test to see just how much headroom there is, and how feasible it is to tune a vehicle. What’s involved in an initial tune? Tunes are generally created in stages and depend on what combinations of hardware you fit. The software is what the ECU would like the engine to do – the hardware is what helps it to achieve it. Performance ECU software designed for a standard engine. ECU software plus breathing upgrades, for example an uprated intercooler, intake system, and sports cat downpipe. ECU software, breathing upgrades and an enhanced turbo. ECU software, breathing upgrades, big turbo, and fuelling/injector modifications, but this varies from car to car. What demonstrator cars do Revo have? How do you go about getting a tune and how long does it take? Revo have over 400 authorised dealers worldwide who you can contact for advice. Stage 1 software is more than enough power for most, but if you’re hungry for more, you can look in to more extensive upgrades like Stage 2 or 3. Installing Revo software is pretty straightforward and quick. However, the health check carried out prior and the data logging to set your car up afterwards means it can take an hour or so. Hardware is obviously a much bigger job, but normally takes a few days depending on what you’ve opted for. And the big question… how much does it cost? Cost all depends on what you want. Stage 1 ECU software from Revo starts at around £399+VAT depending on the vehicle; cheaper are available, but remember, you get what you pay for! For a full Stage 4 build, including software and all the hardware you would need, bigger turbo etc, you’d be looking at £3000+VAT, again depending on your car and your engine.